New Zealand has 3 primary international airports: Auckland, Wellington and Christchurch. From any of these cities you can catch a direct flight to Nelson. We recommend Air New Zealand - proudly the national carrier of New Zealand. We can arrange private transfers to the lodge from Nelson, please call/email us for details. 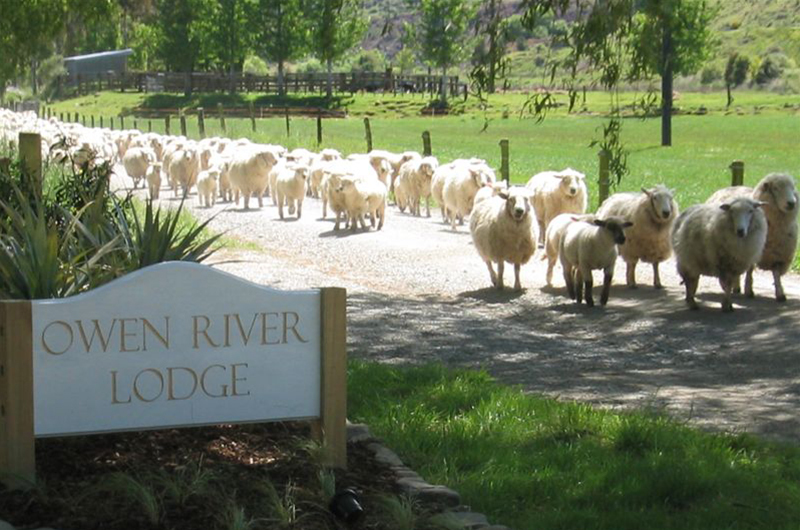 We are located 2 kilometres down a country lane from State Highway 6 (opposite the Owen River Tavern), 15 minutes north of Murchison, a leisurely 90 minute drive from Nelson or approximately 3.5 hours from Christchurch (please give way to the sheep). Drive out from the airport, take the first roundabout and turn to the right. Follow this road (about 1 kilometer) until it ends at a T-intersection /roundabout. Turn right. You are now on the highway (State Highway 6) that will take you all the way to the lodge (just follow the signs to Murchison). The lodge is located about 100 kilometers from the airport. On the way (50 kilometers approx) you will go over the Motueka Bridge/River - keep following the signs to Murchison. You will see a sign on your left pointing to St. Arnaud (don’t turn off) - you are now 20 kilometers approximately from the lodge. You will then see a sign on your left saying Lake Rotoroa (don’t turn off here either). You are now about 10 kilometers from the lodge. You will soon see the Owen River Tavern on your left - don’t worry you can’t miss it. It’s a two-storey white pub/hotel in the middle of nowhere. Slow down and just before the bridge, turn right up Owen Valley East Road. This is just after the pub, but before you cross the Owen River bridge. The lodge is two kilometres on your left. 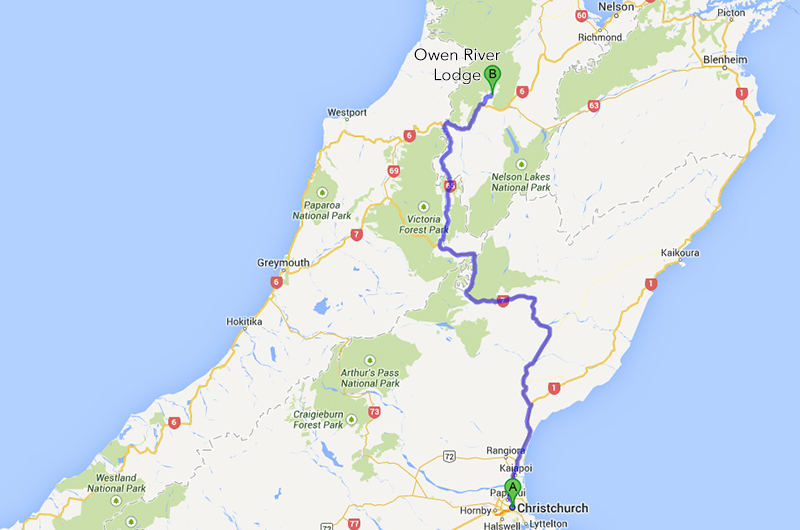 Head out of Christchurch towards Kaikoura/Picton (State Highway 1) and drive though Amberley. Approximately 10 kilometres after you leave Amberley you need to turn left off the highway towards Hanmer Springs/West coast (State Highway 7). 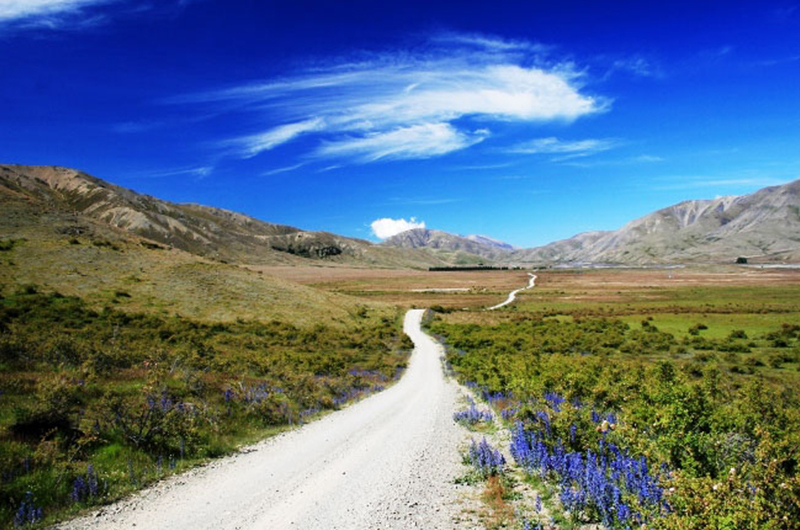 This will take you over the Lewis Pass. The next turn is at Springs Junction. Turn/veer to the right and follow the signs to Murchison (State Highway 65). 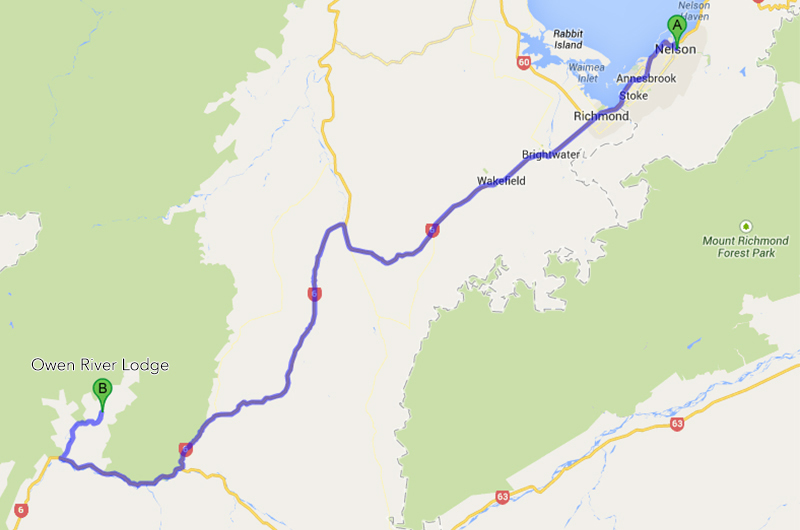 The Lodge is 20 kilometres after you leave Murchison (towards Nelson on State Highway 6). On reaching the Owen River bridge, cross it and turn sharp left onto Owen Valley East Road. The lodge is located two kilometres down this road on the left. New Zealand is a 3.5 hour flight from Eastern Australia. From the West Coast of the United States, a direct flight to New Zealand is 12 hours. From other places on the Pacific Rim, like Singapore, Hong Kong and Tokyo, flights take around 10 hours. New Zealand Customs officers are very serious about maintaining New Zealand’s disease-free status. Its imperative that you declare any fishing equipment you have ! Please make sure your boots and waders are absolutely dry and spotless with no mud, grass or any other material attached to them. We recommend that you do not bring any fly tying materials (e.g. feathers).